The Alerts & Notifications feature allows you set rules and settings about a number of Alerts that will be delivered to your Administrators Email Inbox or into the particular cleaners Supervisors Email Inbox. This Alert allows you to set rules to be notified by email when an Employee is LATE to a Visit. You can adjust the rules to alert you when that Employee is 5, 10, 15, 30, 60 and 120 minutes late for a Shift. The lower rule times are great if you have very specific Start Times for your team, however, some businesses provide a little more flexibility so 60 & 120min Notifications at least let you know if they are well behind the rough schedule. 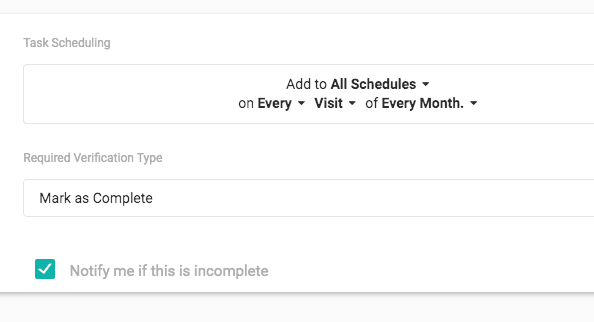 This Alert allows you to set rules to be notified by email when an Employee has over-run the specified time assigned to complete that particular visit. You can adjust the rules to alert you when that Employee is 5, 10, 15, 30, 60 and 120 minutes over the Scheduled time. This is not only a great feature to ensure your Team are completing work within the budget, but also forms part of your Duty Of Care for Lone Worker Safety. Incomplete Task Notifications alert you of any Incomplete Tasks (that you requested to be notified of) upon your team Checking Out of a site. When creating a task at the bottom of the Task Creation screen, you have the option "Notify me if this is incomplete". Only Tasks that have this option ticked will be included in the Incomplete Task Notification. We think of this as a feature you use for those Business Critical Tasks that MUST be completed. A use case could be when a Specific Task is requested by the Client. Add the Task to the upcoming Visit, we would suggest requesting Photo Verification and ensure you mark the option to be Notified if it isn't complete. Rather than have an irate customer call tomorrow complaining that specific task wasn't completed, you get notified as soon as the team check out, which would prompt you to call them and ask them to head back and complete that Critical Task.